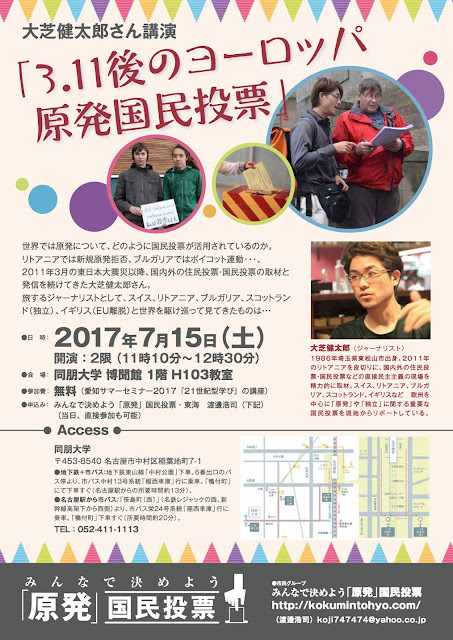 I will talk about "Referendums about Nuclear-Power-Plant in Europe after 3.11" in Nagoya, Japan. In 11th March 2011, the great earthquake occurred in the east part of Japan. We call the disaster, "3.11". After, that Japanese started a discussion about the Nuclear power plant in public, because of disaster Fukushima. Many people changed mind about nuclear after the disaster. Before 3.11, they had accepted it. However after Fukushima disaster, Japanese majority were against rerunning Nuclear power plant, but our Government decided to keep using it, so I thought we need direct democracy through the experience. Then, I visited Lithuania, Bulgaria, Swiss, Germany, Scotland Ireland and U.K where referendums are used in Europe. I will talk about what happened in these countries when referendums held.